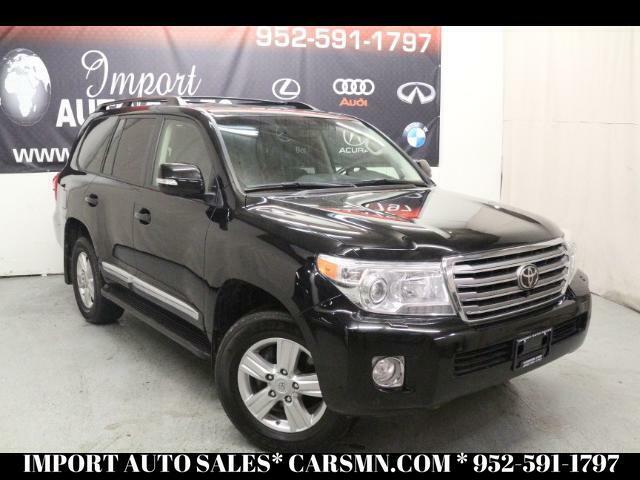 This Toyota Land Cruiser has a dependable Regular Unleaded V-8 5.7 L/346 engine powering this Automatic transmission. REMOTE ENGINE STARTER, BLACK, PERFORATED LEATHER TRIMMED INTERIOR, BLACK. Carfax One-Owner. ALL WEATHER FLOOR MATS & CARGO MAT (6-PIECE SET), Window Grid Diversity Antenna, Wheels: 18" x 8J 5-Spoke High-Gloss Alloy, Ventilated Front Seats, Trip Computer, Transmission: 6-Spd Sequential Shift Auto (ECT-i), Transmission w/Driver Selectable Mode and Oil Cooler, Tracker System, Tires: P285/60R18, Tire Specific Low Tire Pressure Warning, Tailgate/Rear Door Lock Included w/Power Door Locks, Systems Monitor, Splash guards, Single Stainless Steel Exhaust, Side Impact Beams. Import Auto Sales graded the Overall Condition of this vehicle as Excellent. Non-smoker vehicle! Carfax reports: Carfax One-Owner Vehicle. As reported by The Manufacturer Summary: After 60 years, the Toyota Land Cruiser continues to define the standards of off-road prowess. Over time, it has adopted the latest comfort and convenience features one would expect from a high-end luxury vehicle. Exterior features include projector-beam high intensity discharge headlights, 18-inch alloy wheels, and a roof rack for your extra gear. Underneath the Land Cruiser, there are reinforced skid plates, which help protect the gas tank, front suspension, transfer case, and radiator. The Land Cruiser continues to rely on the functional design that helped make the original an icon. Exceptional ground clearance and short front and rear overhangs allow for steep approach and departure angles for traversing irregular terrain. Seating for eight, a 5.7L V8 engine with 381hp, an 8,200-pound tow rating, up to 81.7 cu. Ft. of cargo capacity, and unrivaled off-road capability make the Land Cruiser a capable family mover. The Land Cruiser's rugged ladder frame ensures off-road survivability plus outstanding towing capability. Despite its rigid body construction, ride quality is quite smooth, even over broken pavement. Body roll and lean are kept in check with help from the Land Cruiser's Kinetic Dynamic Suspension System, and the steering response is precise and confident. Once inside the Land Cruiser, you will experience remarkable comfort sitting in the luxurious perforated leather seats. Both front seats have heating and ventilation, and the second-row can be heated as well. There is also the Premium HDD Navigation with Entune App Suite and JBL. It has a high-resolution, 8-inch touch screen, an integrated backup camera, hands-free phone capability, Bluetooth music streaming, and the amazing sound of 14 JBL Speakers. You've earned this- stop by Import Auto Sales located at 6009 Wayzata Blvd Suite 110, ST. Louis Park, MN 55416 to make this car yours today! Inquire Online or Call Us at 952-591-1797 Great Financing is Available and Trades are Welcome!! Message: Thought you might be interested in this 2015 Toyota Land Cruiser.